Approximately 1000 people are killed annually compared to approximately 250 fatalities due to accidents notified annually under the Reporting of Injuries Diseases & Dangerous Occurrences Regulations (RIDDOR). Managing a Driving for Work Policy is a legal requirement under Health and Safety Legislation & Road traffic law. Management and employees can both be prosecuted for road traffic crashes involving work-related journeys, even when drivers are using their own vehicles. A survey of 500 business decision makers reveals that 57% of businesses are unaware that they could be subject to a public order if found guilty of a fatal accident at work. This penalty is so significant that it should ensure that Health and Safety is at the heart of business decision making. Particularly when strategic decisions about investment in training or providing new equipment are being made versus promotional spend. When asked about the implications of breaching the Act-a publicity order or a fine of 10% of turnover, 59% of businesses regarded the former as the greater threat. A risk management policy must be written when a company has five or more employees. Business mileage is any mileage done on the behalf of the business other than commuting, unless they are travelling to a location that is not their usual place of work then it still comes under Health and Safety Law. 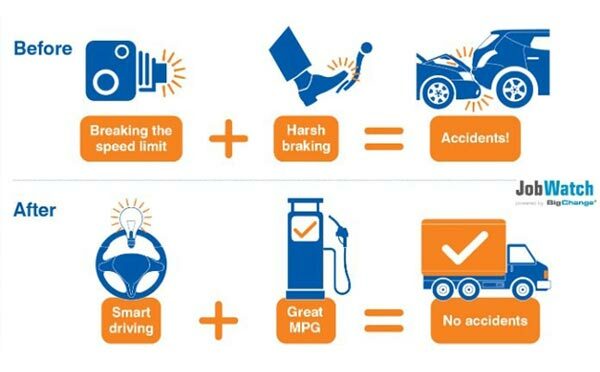 (Source DfT & HSE). Average fleet accident rate 65%, Average bent metal cost – £700 (per vehicle)Average hidden costs – £700 x 4 (£2800) – (between 4-36 times bent metal cost . Average overall cost per crash – £3500. Driver training is a self-funding investment which can be funded from the savings of just fuel alone.